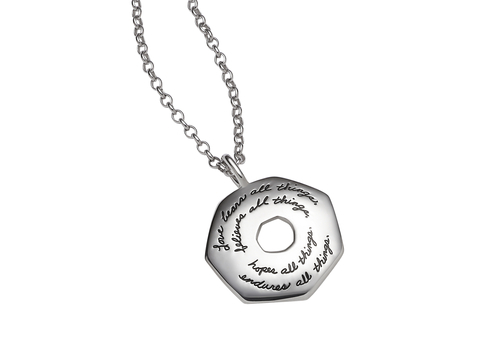 The delicately handwritten script on this sterling silver pendant features one the most popular verses in the Bible: 1 Corinthians 13:7. Philosophers have identified seven types of love, each reflected by the seven sides of this pendant. Based on the varieties of love, you can see that this pendant is a versatile gift choice. It would make an excellent engagement or wedding present to represent romantic love or a fun birthday gift for your daughter, to represent family love. Perhaps today you’d like to show a little self-love and give yourself the gift of a new engraved pendant.